COMPANY PROFILE Rural Electrification Corp Ltd is a financial supporter to the power sector projects. It provides loan assistance to various state power utilities, private sector project developers, central power sector utilities and state governments. Rural Electrification is a nonbanking financial company operating in India. The company’s main objective is to finance and promote power sector projects on the subcontinent. REC provides loan assistance to numerous state power utilities, private sector project developers, central power sector utilities, and state governments. REC investments include power generation, power transmission, power distribution, and other system improvement initiatives. REC is also instrumental in implementing several initiatives spearheaded on behalf of the government of India, including rural electrification. The majority of its revenue derives from long-term financing. 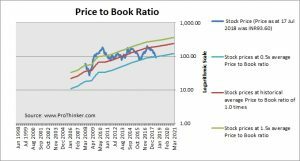 At the price of INR93.60 as at 17 Jul 2018, Rural Electrification Corp Ltd is trading at a Price to Book Ratio of 0.5 times current book value. 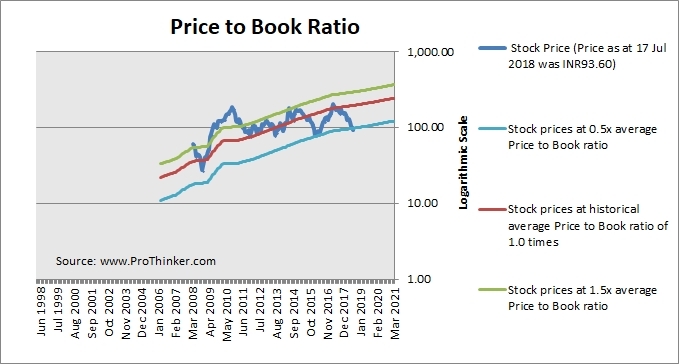 This is a 52% discount to its historical average Price to Book Ratio of 1.0 times.